Tyler: I didn't mean to hurt you, Woody. Woody: I don't like to sound old-fashioned but if you can't manage 'dad' anymore, I prefer sir. I saw this movie in the theatres in 1989, and it's horrible memory lingers on to this day. What to mention first? The gushing tears that too often grace the character's cheeks? The horrible plot device of having JoBeth Williams kneel in front of her record player crying while Your Song by Elton John plays in the background? The sappy teenaged son of JoBeth and Kris? 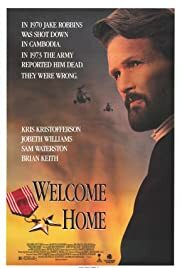 The convenient million or so dollars that Uncle Sam drops in Kris' lap, allowing him to buy a house and a car, unlike most other Vietnam Vets? Or the ease and guiltlessness with which JoBeth hops in the sack with Kris again, after all these years, and despite his deathmasklike craggy features, and despite being married to a much nicer guy, Sam Waterston, who plays the cuckold well, but is totally wasted in this picture. Insipid soundtrack and gushy spineless characters. Not a good combo. How I wish Kris' former family turned their backs on him, after asking a few penetrating questions like "Where the hell have you been?" or "Why didn't you try to get in touch with us?" or "How's about moving to another part of the country and leaving us alone?"